From its first awarding in 2009 on, the Newcomer Trophy was a big success every year. Therefore this year, too, we will reward the best couple that has never before competed in a dancing competition. This is our special way of opening our doors and floors to new broad sports couples. Of course the 2019 tournament will again include not only ballroom and latin, but also a separate discofox fun tournament. It will be held after the latin tournament. Please note that our discofox fun tournament will not be held in accordance with „professional“ discofox competitions. That means above all that there will be no “slow” rounds. Dancers who have got a tournament license for tournament class D and/or compete in formation dancing (Regional League), or who own a comparable license, are permitted to compete in the respective discipline, but not with their own (tournament or formation) partner. In addition, in order to keep up the Breitensport spirit, we suggest he or she compete as a “mixed couple” (partnering with a pure Breitensport partner), if possible. If someone can not find a suitable partner, we request you to notify us early, so that we can help you find someone suitable. 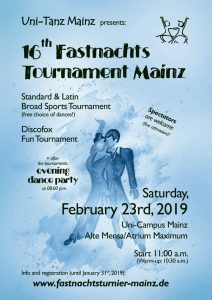 The 16th Mainzer Fastnachtsturnier takes place on 23 February 2019. The registration opens on 11 November at 11:11 am.